"Put on your bunny slippers and pour yourself a glass of wine." Relax, have a good time, and learn how to make cooking at home a breeze with The Stress Free Diabetes Kitchen. Barbara Seelig-Brown takes the ingredients that have made her television shows and cooking classes so popular and reshapes them for those with diabetes. Learn how to gather a dependable repertoire of versatile recipes that will become your "go-to" meals. This book is great! I love to cook and I have a young 9 year old daughter who has diabetes, so having the carb count is a necessity. The recipes are wonderful and simple. The recipes also made me think of different ways to have low carb meals, which is our primary goal. We have made 2 recipes so far, and the whole family has been more than happy. We are looking forward to making more recipes. Even though I have been cooking for 20 years, I found the tips in the book helfpul, and it inspire me to cook as I read the book. 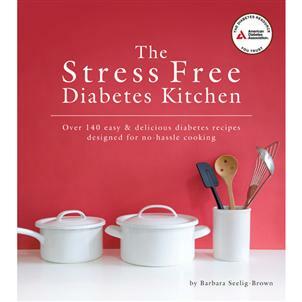 I would definitly buy this book as a present for anyone with diabetes, and anyone who loves to cook. Excellent book!!! I love cookbooks that have short ingredient lists and easy-to-follow instructions. This book does it to perfection. And, I also appreciated having the Exchanges/Choices information for the recipes. I love cookbooks and could pass entire afternoons reading them. I love them even more when the recipes are healthy, the ingredients are simple and the directions are straightforward and easy to follow. This book is all of those things and more. I have been fortunate enough to sample the author's cooking in her home and can attest to the "stress free" nature of her recipes. I constantly marvel at her relaxed approach to preparing a great meal. The recipes in this book mirror her approach and philosophy. Most are very simple to prepare and fairly fool-proof in their results. My wife and I have all her books and keep them right on our kitchen counter for easy and fast reference. This one will certainly join the others. Another great job Barb! I have used this cookbook for a few months and every recipe I have tried is outstanding. I want easy, fast, healthy and delicious and this cookbook has it all. The recipes are developed for those with diabetes, but I have served them to non-diabetic guests who rave about the flavorful, fresh, healthy food I prepare and request that I serve it again. Love the "cook's tips" next to each recipe. I love Barbara's cookbooks. Her easy to follow recipes and extra "Cook's Tips" make cooking truly stress free. I like that the recipes don't have hard to find ingredients or take hours to make. And everything is healthy and delicious. This cookbook is a great companion to Barbara's "The Diabetes Seafood cookbook". This book is FANTASTIC! The recipes are delicious and very easy to follow. This has taken alot of the stress out of planning meals. As with her other book The Diabetes Seafood Cookbook I especially enjoy the added Tips she includes. Excellent resource. I have had the pleasure of Barb's friendship for many (many) years. We've gone from mud pies to dinner parties together. Unfortunately, cooking is NOT stress freee for me, so when I have "special" guests, I know I can turn to any one of Barb's cookbooks to find something impressive and elegant, yet simple enough for me to follow with instructions I understand. The true ingredients of a great recipe! 1 why can't I read reviews?